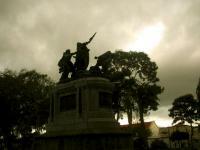 National Monument at San Jose has been part of the Tentative list of Costa Rica. As what to the monument concerns, it was encharged to the french sculptor Louis Carrier Belleuse, disciple of Rodin and even it is argued that the master participated in some of the parts of the monument. It was shipped to Limon port, transported to San Jose and assembled, its inauguration was celebrated in 1895 with the greatest honors to the heroes that parcipated in the campaign. It is made up of seven figures and a pedestal, five of them representing the five central american republics of the time, another is the invader being expelled and the last depicts a dead soldier from the costarrican army. Finally and I have said in other reviews, it does not have definitively value for a WHS proclamation, but its importance in national terms is obvious and deserves to be kept for the future generations.